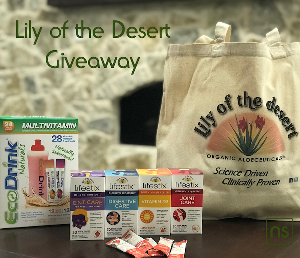 Prize: Lily of the Desert Giveaway! Win one of three amazing prizes valued at $125. The prize includes: EcoDrink Naturals Multivitamins + Mixing Bottle Lifestix Condition Specific Powders And a reusable canvas bag. Enter to win today. What you must do to enter: Simply fill in the form to enter.